When it comes to picking classes, it’s a Process. The Process begins months before I actually need to pick the classes, months before I even know what classes are being offered. I analyze my degree audit (which shows what classes I have taken and the requirements that remain for me to graduate). At least once a semester, I’m in tears because I decide I won’t graduate on time. Needless to say, selecting the classes I want to take while I’m abroad has not been simple. I started looking at the classes at FUA as soon as I had an interest in the program; the experiential learning aspect of the classes heavily contributed to my decision to study in Florence. Over the summer, I discovered the schedule of classes for the spring semester. I currently have twenty-four notecards, two Word documents, and one Excel spreadsheet (two sheets)…and they essentially all serve the same purpose. The Word documents have been neglected at this point: the actual decision making lies in the Excel spreadsheet and the notecards. Trying to ‘excel’ at making decisions; not succeeding. 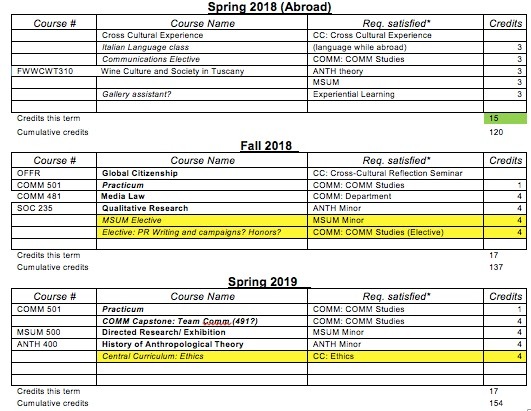 I need to fill fourteen class requirements in the next three semesters to graduate in spring of 2019 with a major in communication studies and a double minor in museum studies and anthropology. Eight of those classes are specific and must be taken at Susquehanna. The other six, in theory, could be taken abroad. That’s where the problem comes in. I can take a maximum of fifteen credits while I’m abroad and most classes are three credits. Take out the language course and that leaves me with a mere twelve credits worth of decisions. Twelve credits is not enough. After painstaking, color-coded effort, there were still twenty-seven credits worth of classes I wanted to take. Most recently removed from the list is “Philosophy and Science in Early Modern Italy.” I needed to request the syllabus in order for it to be potentially approved for the ethics requirement. Given how much I wanted to take some of the other options, it simply wasn’t worth the effort. Now I’m down to twenty-four credits. I’m waiting for the museum studies department to let me know which classes will count for a museum elective (although I’m pretty sure that all the classes I proposed will count). The only thing that doesn’t actually fulfill a need is the pasta class. 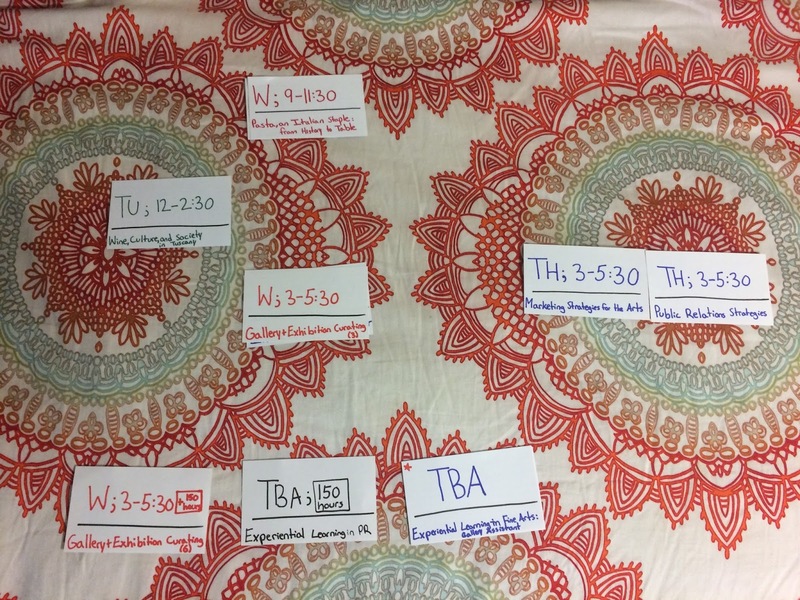 I try to tell myself to be reasonable: only take one food class, only take one class with 150 hours of experiential learning, start by getting rid of one of the Thursday, 3:00-5:30pm classes (since I clearly cannot take both anyway). I need to cut out half of the classes I desperately want to take. Decisions are hard. Maybe I should just make some pierogis and eat lunch.